By the end of the lesson students will have : - Become aware of the way we spell words; - Internalized the new vocabulary; - Personalized English through acting. Skills : speaking, reading, listening and writing. Aids : the handout, the blackboard, the whiteboard, sheets of paper. 1. Educational: presentation of the construction “ How much is that?”, to enrich the vocabulary (Anything to drink? Anything else?) 2. Developing: To develop pupil’s habits and skills in reading, writing and speaking, memory and mental activities. 3. Bringing up: to develop the ability of self – studying, to attract the pupils attention to the language peculiarities, to develop interest to the subject. Intellectual game Who is the best? 1. It is situated in the central part of the North American Continent. 2. The total area of the country is more than nine million square kilometers. 3. The population of the country is about 265 million people. 4. Barak Obama, head of the State is the President, who is elected every four years. 5. The United States is a democratic federal republic. 6. National flag, emblem and anthem 7. The 50 stars of the flag symbolize of 50 states in the USA 8. The flag of the United States of America is called “Stars and Stripes”. There are three colours on the flag- red, white and blue. Americans are proud of their flag and display it in many places. Pupils in each group must make up the combination of words such as: with the verb play, go, do, ride – mountaineering, cricket, tennis, rugby, yoga, weight lifting, a bike, swimming, running, football, basketball, a horse, a bicycle, volleyball, gymnastics, judo, jumping, windsurfing. түстердің(қызыл,көк,сары,жасыл,тоқсары) суреттері, мнемосызба, «Спот» ит ойыншығы, тақта, үнтаспа мен магнитафон, доп, теледидар, слайдтар,қағаздан жасалған гүл, қарандаштар, жемістер(алма,апельсин,алмұрт,банан), жасанды шырша, шырша ойыншықтары (бала санына қарай), шарлар. 1.Ұйымдастыру кезеңі Teacher : Good afternoon, children and our guests! I’m very glad to see you here. Now we shall organize a competition called “ Improve Your English”. Two teams will take part in a game of the most quick-witted and the cleverest. It’s time to introduce yourselves. Who is the captain of the 1st team? P1: I’m the captain of the team. The name of our team is “Stars”. Our motto is “Enjoy English!” Teacher : Who is the captain of the 2nd team? Teacher greets students. T: Hello! S1: Hello, my name’s Aset. S2: Hello, my name’s Saken. Teacher shows flash cards 1-4 T: Hello! My name’s Rinat. S1: Hello, my name is Aslan. T: Hello, my name’s Berik. S1: Hello, my name’sSamat. Teacher shows flesh cards with speech bubbles for children to read. Армысың,алтын елім,жиған нұрды, Жүрегімнің түбіне салғансың,от жалынды. Кеңдігің тамсандырды бар әлемді, Кеудеңді аш,ақтарайын талай сырды! Қазақпын мен! Қазақ деген атыма мақтанамын! Соғысты жеңіп шыққан қан майданын. Ар-намыс,рухын алға қойып, Түп – түзу қырып жықты неміс елін. Ұзақ ұйықтап қалыппыз қайран елім, “Оян Қазақ!”-деп жырлады ақын ерім, Тым-тырақай,шым-шытырық бұл өмірде, Әрқашан бейбітті бол асыл елім! Білім беру процесінде ізденістің алар орны ерекше. Құр дайынды көшіру оқушының шығармашылық ойлау қабілетін, талабын өшіреді. Сондықтан әр түрлі әдіс-тәсілдерді оқыту барысында жиі қолдануға тырысамын. 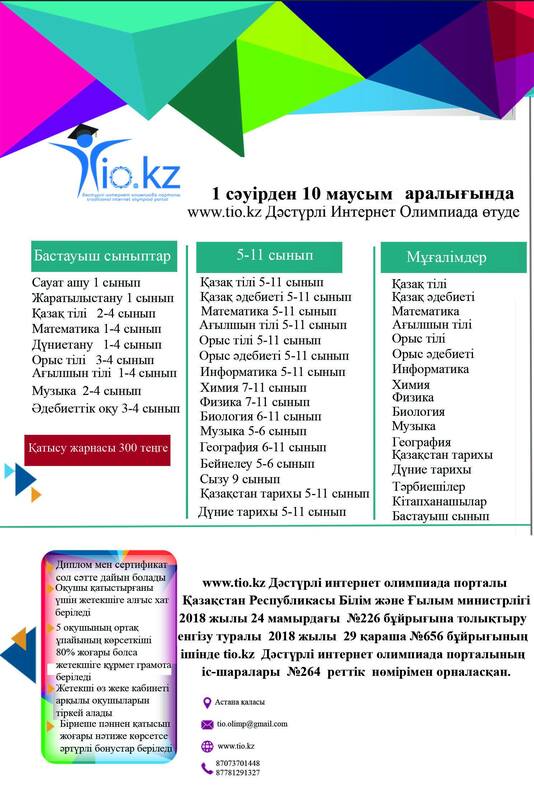 «Happy English» курсы оқушыларға ағылшын тілін меңгеруге көмектеседі. Біртіндеп тіл үйрену барысында олар өзара сөйлеу, басқаның айтқанын түсіну, оқу және жазуды меңгеріп, ағылшын тілінде жаңа сөздермен танысады.